Despite access challenges, Aztlan Outdoor Living created the ideal outdoor space for these homeowners to spend summer evenings with a few friends and a glass of wine. Before Aztlan’s transformation, this backyard was all lawn. “The home was built about 2 or 3 years earlier and the landscaping consisted mainly of grass,” recalls Jorge Castellanos, president of Aztlan. 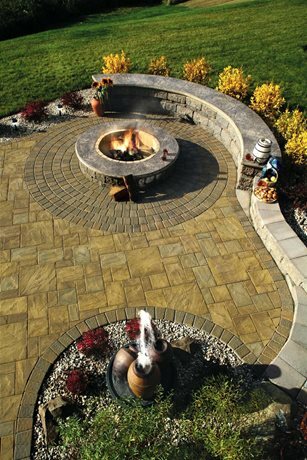 Jorge and his crew laid a paver patio, built a fire pit, seat wall and bar, installed a pondless water feature and added plantings around the perimeter. Ledgestone pavers from Cambridge were used for the main portion of the patio. Because of the curved patio edges, precise cutting was required. 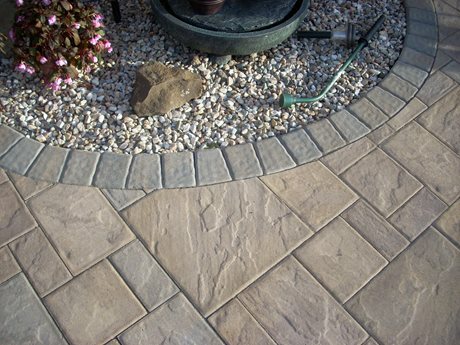 Special pavers designed to be laid on a radius were used as a border. 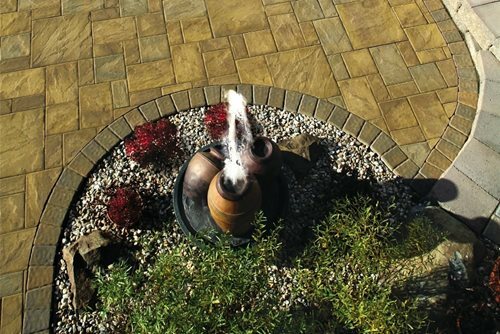 Jorge explains that a layout that calls for pavers to be cut will require a significant amount of time to install, but he believes the results are worth the effort. 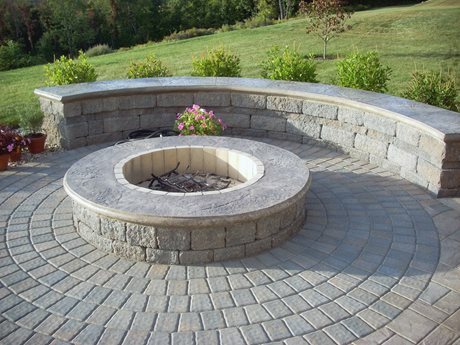 The fire pit and seat wall were constructed with Cambridge’s stretcher block wall system. Both features were capped with stamped concrete cast-in-place by Concrete Expressions, a local company that Aztlan often works with. To prevent the concrete from cracking due to the high heat that a wood burning fire pit generates, the inside was lined with fire brick. 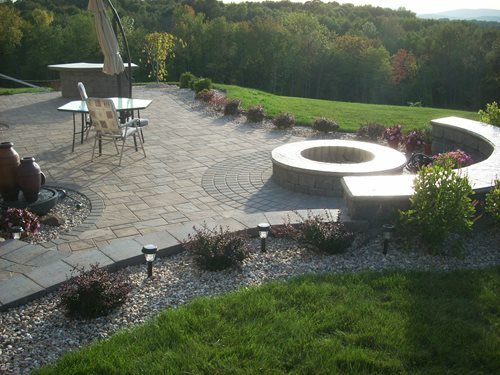 A circle kit was used to create the paver pattern surrounding the fire pit. “We built the wall after the circle kit had been laid, using the round edge as a guide for the curve of the wall,” explains Jorge. 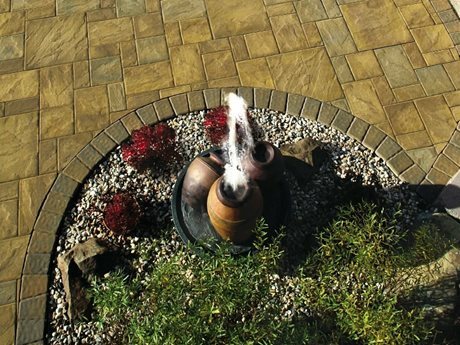 The water feature was purchased by the homeowner and installed by Aztlan. In order to create a pondless effect, a reservoir from Aquascape was installed underground. The landscaping stone that fills the planter hides the reservoir from sight. Jorge points out that even in this type of application, the pump can still freeze in winter, so it is best to remove it before it gets too cold. Planting beds surround the entire patio to create a barrier. “The owners were concerned with safety since they live on a hill that drops off just a few feet past the edge of the paving,” Jorge says. Enclosing the patio with plants keeps people from venturing off the patio. Stone was used instead of mulch because of frequent winds. Jorge noticed that most of the mulch in the existing planters had blown away, he knew that the added weight of the stone would work much better.